We study regular graphs whose distance-2 graph or distance-1-or-2 graph is strongly regular. 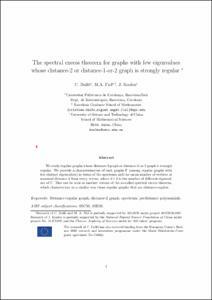 We provide a characterization of such graphs G (among regular graphs with few distinct eigenvalues) in terms of the spectrum and the mean number of vertices at maximal distance d from every vertex, where d+ 1 is the number of different eigenvalues of G. This can be seen as another version of the so-called spectral excess theorem, which characterizes in a similar way those regular graphs that are distance-regular. Dalfo, C., Fiol, M., Koolen, J. The spectral excess theorem for graphs with few eigenvalues whose distance-2 or distance-1-or-2 graph is strongly regular. "Linear and multilinear algebra", Juliol 2018.